Maria, the lovely brunette, (she/her/hers) and Sally, spirited blonde, (she/her/hers) are absolutely darling. I first sat down with these two at a dinner party they hosted. Hands down, Maria and Sally are salt of the earth people who have worked hard to build a life together. 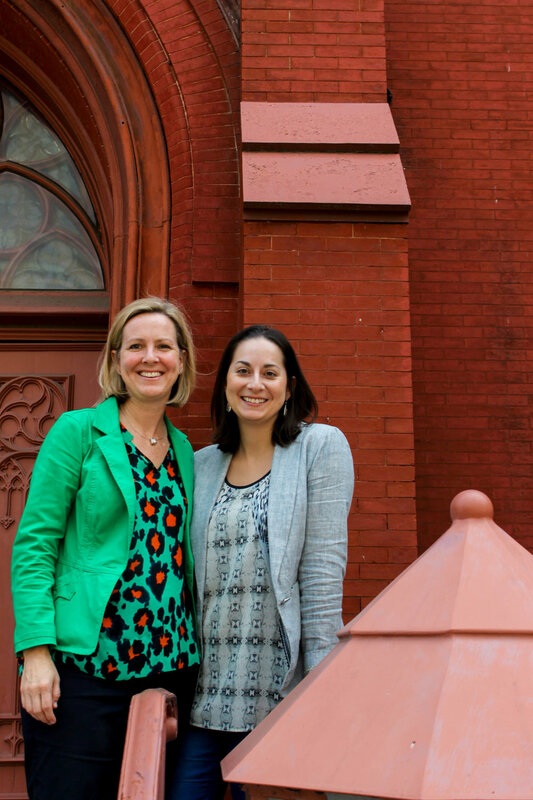 Even more, Maria and Sally are a co-pastor team at Calvary Baptist Church, something relatively unheard. Maria and Sally, your heart and grit are beautiful! That affirmation of love has always been something I’m really drawn to. When did you start to realize your identity? S - For me, it was a long slow process. I think I knew that I was a tomboy and not the classic “girl” growing up. Like, when I was 6 years old, I cried and begged my mom to let me quit dancing. But that didn’t translate into finding myself in a particular way or how I might find or express love. It was truly the encounter of love that really opened the doors of what I thought love was and looked like. M - In my childhood I remember being drawn to girls in a different way. But it was that dual experience in my upbringing that taught to think “Ok, I feel drawn to girls differently than boys. That’s a thing, but it’s not allowed to be a public thing. So maybe everyone has that quiet thing they feel but it’s not something you can live into?” So, essentially, I experienced it early on but also knew it wasn’t something I could act on and it was something that was different from everyone else. I often joke with non-queer friends that everyone should have to come out as something in life because there is great becoming in the process. Coming out is a deeply forming and informative process. It’s a question about how you love. That’s a beautiful question to ask of oneself over time. So the two of you came out alongside one another? M - For us, coming out was a process of falling in love with another. S - It took us a year to figure that out, though. M - Yeah, it took a long time. It was a “Yes” and then a “That can’t be” and then an emerging “Yes!” that we lived into. And neither of you dated anyone else prior to realizing you were same-gender-loving? S - Correct, and then we got married. M - We think it’s a cute story too. Tell me more about your story. M - We definitely felt attraction for one another over the years. But our relationship made us realize this was something we had to acknowledge. When we first met I was in Seminary doing an internship at First Baptist Greenville in Durham. Sally had just moved back into the area and she was attending First Baptist Greenville as well. S - Yeah, we met at church! M - Sally had signed on to act as a caretaker for the Summer Intern, and that was me. So we often say that I just kind of showed up on her doorstep. S - We describe that summer as a summer of falling in love. At the end of that summer, I felt like “This is beautiful, but I’m going to be a pastor, so this feeling can’t be.” At that point, it took us an additional year and a half of calling one another “friend” before finally claiming each other and ourselves. Tell me more about that initial feeling of love. S - In some ways, it was pretty fast. Instant even. I can remember this moment when I was driving home and I was about to pass the church and I was asking myself “Ok Sally, if love shows up in a different package than you expected and was expected of you, would you really reject it?” It was pretty clear to me then that this was love. It wasn’t a friendship. I mean it was that too. But it was more than that. M - I think that’s what we kept trying to figure out. We had this friendship built on a beautiful and profound love, but there was also this building up of a new love. We had to untangle our romantic feelings from our friendship. But the depth of our friendship was rooted in the depth of love and intimacy we wanted to experience with one another. S - We’ve actually been looking forward to this conversation, replaying our early encounters with one another. Tracing the roots of early love. That feeling of fluttering stomachaches that comes with the newness of love. I don’t have the vivid memories of a lot of things. But I have very very vivid memories of that summer. M - I have this vivid undoubted palatable memory of meeting Sally. I was shadowing one of the ministers at a planning meeting and she was on the planning team. And I remember she kept looking at me. I kept wondering what she was looking at me for. The subterranean part of my mind was like, “She’s really pretty. Why does she keep looking at me? !” At the end of the meeting she came over to me and introduced herself, “Hi, I’m Sally. I’m one of the hosts for the summer interns. And I remember thinking “Oh, well she’s been looking at me because she realized who I am.” At that point, though, it didn’t matter. That fluttery feeling didn’t go away. Tell me more about your memories. M - Within the first few days of meeting one another, we were having hour-long conversations; talking about theology, identity, and our interests. I remember trying to find a place to meet and talk. One day, I remember agreeing to meet Sally on Furman University campus so we could walk and talk. I can even . . .
S - Trace that first walk still! M - Yeah! Two years later, when Sally and I were starting to think about life together, I was figuring out how I could get back to her at Greenville. I ended up taking a job at Furman as a college chaplain. For the next seven years of my life, I kept tracing the path of our first walk on that campus. Replaying this vivid early memory of our beginning stage of experiencing life together. Now, we’re nearing a decade of knowing each other and remember the traces of our relationship. When did you realize you were pursuing life together? M - There were moments along the way of pressing into love and then pressing away. We had a lot of conversations that summer to try to figure out what to call what we were feeling. S - I don’t know if we ever figured it out! M - I don’t think so either! So then Sally and I had a conversation on the phone and were trying to parse things out. We ended on the note we always did “This is beautiful and profound but I don’t really know what to do with it. So I told her, “If you ever want a good love note from the inside of someone’s belly, I have one for you.” And she said, “Yes, I do.” So I read it over the phone while she wept. S - I knew we had to figure out a way to meet face-to-face. What was the coming out process like as a couple? S - One of the concepts that became really important to us was not feeling obligated to come out to people. For us, it was important to think about it as letting people in, rather than coming out. So we chose the people that we trusted to share our sacred information with. It was about privacy, not secrecy. Our relationship was our story. Even though there’s a lot of shame to wade through in coming out, it helped us claim something that was good, rather than feeling like we had to confess something bad. M - That was something really huge for us. We ended up having a conversation with someone that gave us that language. When I heard it for the first time, I almost sank to the floor. At that time there was a frenzy about “coming out” and deceit. It was a thing about secrecy and society asking, “How could you keep this thing from us? “It was a shift from deceiving people, to acknowledging that we had this scared and beautiful relationship that we could share with the people we wanted to. Our sharing wasn’t about confession but about gifting someone with our story. When someone earned our trust, then we entrusted them with our relationship. Even just to tell people, “I'm inviting you into this portion of my life and I’m grateful that I get to do that,” changes the entire conversation. It's no longer shameful, it’s joyful. M- We like to tell the three-wedding story. The first was early on in our relationship. I had just moved back to Greenville. We began calling our relationship “life together” and we wanted to bless that with vows and our commitments to one another. But we weren’t there yet with friend groups and family to have a wedding. So we offered vows to one another and hiked to this really beautiful waterfall, it was a special place for us. S - At our second wedding, we had already given our vows to one another. This was a point where we invited others in to bless and celebrate those vows. We called that ceremony our Celebration of Vows. M - Wedding Two was an outdoor wedding venue on a working farm in the mountains - probably one of the most beautiful places I have ever seen. Friends and family came. That’s the day we mark our anniversary. We even had a full bow rainbow that day which was pretty unbelievable. It was just a gorgeous day through and through. S - And then Wedding Three we had no way of knowing would happen. There’s a sense in which our marriages have followed the progression of marriage in the united states. Before gay marriage was federally legal, all of a sudden it was legal in South Carolina, 6 months after our Celebration of Vows. M - At noon that day Sally called me, we were both at work. I remember her saying, “They’re issuing the licenses, do you want to meet up?” So we did. I had meetings that afternoon so we quickly went down and got it. After, we went for lunch and then back to work. This third wedding took all of about 72 hours to plan. Over the weekend we planned this quick beautiful thing and threw another wedding. It was nuts but awesome. People came in their work clothes! Finally, we had this beautiful blessing of our vows becoming legalized. Do you have any coming out advice you would like to offer? S - First, be kind to yourself. Because of our culture we all have significant amounts of internalized homophobia. Because it’s inside of us, it’s essential to slowly release that. So, try to find a good conversation partner. For us, that happened to be a minister friend and then eventually a therapist. I want to also add that you need to talk with someone who is welcoming and affirming. If your conversation partners are people who feel like they have a commitment of talking you out of being yourself or coming out, it can be damaging. Find the right conversation partners. M - Without getting into too many details, my story is one of significant loss with family systems and family origin. So I think really being invested in self-care, whether that is a community or a pastor or a therapist or all of the above, is really important. There is the possibility of severe loss. Don’t isolate yourself and go through the process alone. I use the image of shaking the dust off your feet. It's a biblical image that Jesus offers the disciples. I think it's imperative for queer folks to not find themselves mitigating or making it ok for people to simply accept them. There might be space for that or you might have a call for that, but your own fortification in who you are is more important. So basically, don’t waste too much time on the haters. S - For us, addressing shame was also really important. We had to keep reminding ourselves that this was a beautiful thing. M - We’re celebrating that we found and loved another!